Sometimes it feels like what's happening now, at any given moment, is bigger, more important, worse, and more dangerous than before. Luckily, that often turns out to be incorrect: Today's news is tomorrow's hazy memory, and what once seemed like an existential threat is now nothing more than an unpleasant recollection. It sure seems like there are frightening events happening everywhere today—from ISIS to Ebola, Russian imperialism to Chinese saber-rattling, climate change to congressional dysfunction. But is it really worse, or will this, too, pass? Bad news: It's really worse, Defense Secretary Chuck Hagel told James Fallows at the Washington Ideas Festival Wednesday. 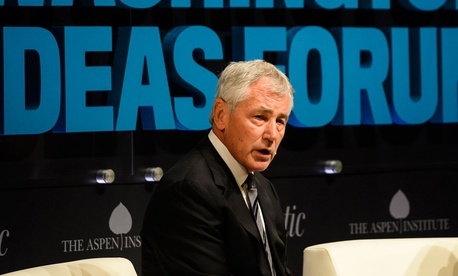 "I think we are living through one of these historic, defining times," Hagel said. "We are seeing a new world order—post-World War II, post-Soviet Union implosion—being built. There are many questions, foremost among the American people: What's the role of America in this new world that is evolving? Should we have a role? What is appropriate?" And Hagel didn't seem especially sanguine that it would end anytime soon. In other words: Get used to endless war. "What we’re seeing in the Middle East with ISIL is going to require a steady, long-term effort. It's going to require coalitions of common interest," Hagel said. But he noted that cooperation is in short supply, especially in his old stamping grounds on Capitol Hill, where Hagel served two terms in the Senate. "I hope that changes after next Tuesday; I don’t know," he said. "Partnership is critical, because its not a matter of 'We all have to agree.' We need different opinions, but ... both sides get to some conclusion and make a decision on how we go forward." He noted in particular the challenge of global warming, which Hagel's Pentagon has made a priority, declaring it a national-security threat, even as Hagel's own Republican Party continues to block broader steps. Even if a new era of comity arrived in Washington, however, Hagel forecast that the U.S. would continue to grapple with overseas threat for the foreseeable future. "Tyranny, terrorism, the challenges and threats to our country ... is going to be with us," he said. "It’s a reality. I see these things continuing to stay out of there."